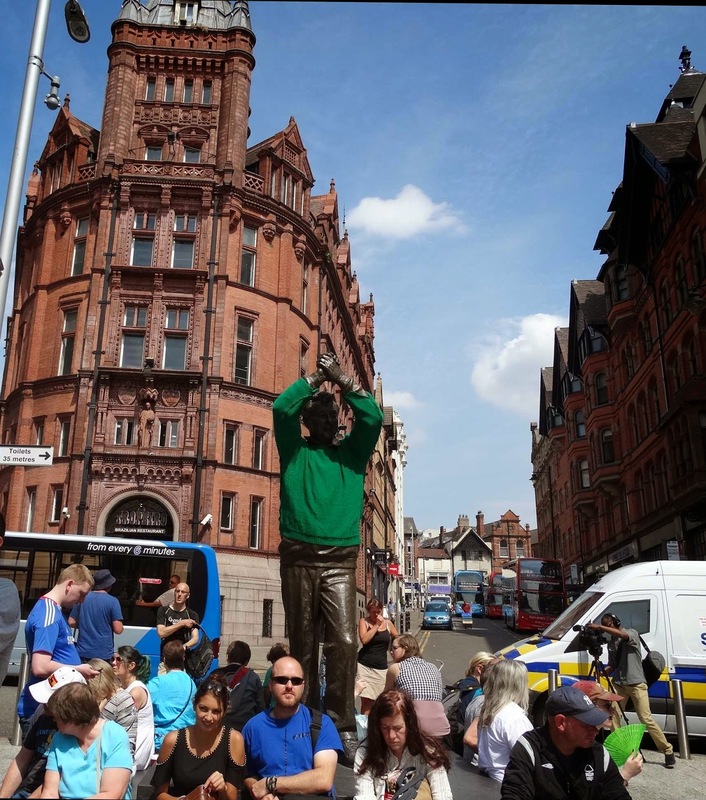 You've probably heard of flash-mobs before- perhaps even taken part in one; well today I was a participant in a reading session flash-mob in Nottingham city centre. This was organised by Dawn of the Unread - they're on Facebook and Twitter as well- to show support for libraries. The meeting point was the statue of 'Cloughie' -Brian Clough (best known for being the manager of Nottingham Forest football club) and the paved area in front of him; this area leads down onto the Market Square- currently hosting Nottingham by the sea- they put in a beach area, a bar, and various fairground rides for the school summer holidays. NottsTV were there filming the event. I'm pleased it was a bright sunny day, so lots of people attended. The city centre is always busy and noisy, especially on a Saturday, but for 10 minutes there was a quiet haven where we all sat down and read. I'm sure a few passers-by wondered what was going on - they stood around the edges, but no one minded the readers taking up space. I sat down and propped my back against the tree to read my chosen book, and I was grateful for the little shade it provided- it was getting very warm by midday. 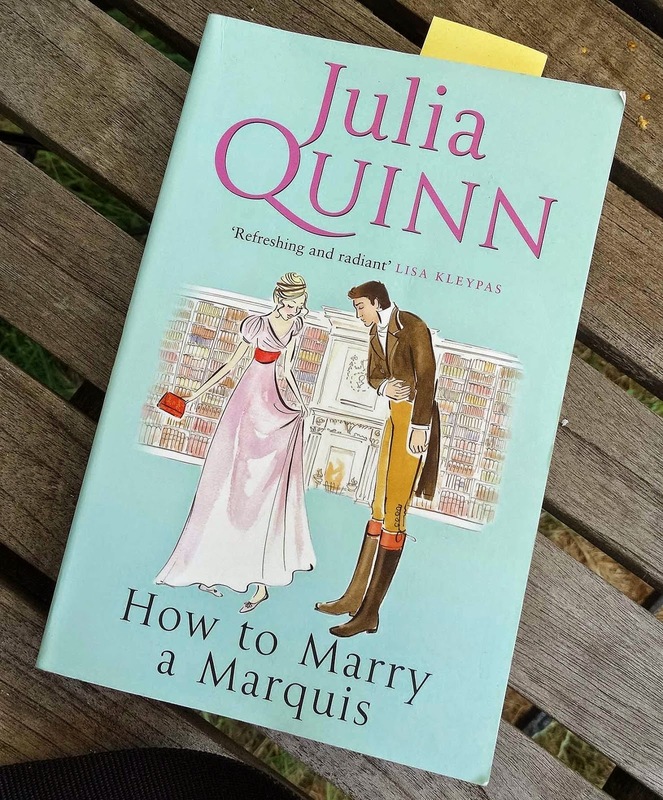 My reading choice for the event was Julia Quinn's 'How to Marry a Marquis'. I'd bought this just before I returned home from Bath in May, but not finished it, so in my bag it went. To my shame I hadn't heard of this event. Saw the photos on your Twitter feed. Glad you enjoyed the day. See you on Wednesday. Did you actually engage with the public or simply set an example by reading in public? Just dropped in from Teresa Ashby's blog. The flash-mob sounds fun. Might suggest it to my writing group! Hello L, the one I attended spread the word via social media a few weeks before via a Facebook events page. We're also fortunate in having space in a central point in the city centre. We stood around the meeting area and only sat down when the first chime rang out. It also only lasted 10 minutes and people could still get around us- there were no banners or anything. And hope it happens and goes well. How exciting, Carol - I've never heard of one for reading, but it's a great idea! That sounds my kind of mob! I've nominated you for the versatile blogger award, Carol.